Newsletter — Victor R. Burgos & Son, Inc. The vast majority of us use our basement as storage. Go down there and it is dusty, may have a few cobwebs and may even smell a bit damp. But as our lives have changed - and they always do, it is time to reclaim that forgotten space and significantly expand our home. Perhaps it can become a play room for the kids. Maybe it is an entertainment area just like we see in the new home advertisements. Or maybe it is that exercise area, dance floor or wine cellar we have been dreaming about! First thing we do is make sure that must smell is taken care of and we work to eliminate any possibility of flooding. A good design for the space, with separate areas that may be needed for that wine cellar or that entertainment area is absolutely key. And lighting is part of that plan, we will make the space bright and inviting! Is it enough just to put in a ceiling and some walls? Perhaps throw down a carpet? No. It is time to increase the size of your living space by 33 to 50%. Now is the time give everyone the space they need…or you know the space you want and you deserve! Posted on November 30, 2014 by Victor Burgos. Many of us have lived in our homes for 20, 30 or even more years! Your home served you well as kids came, grew up and then successfully launched their careers and lives in their own home. And our homes were organized around that activity. Perhaps you added bedrooms or converted a basement into a play area or storage area. For empty nesters all those spaces can be refreshed and transformed into what we need now. Perhaps a hobby room for quilting or sewing, or a man cave just to get away, or maybe even an exercise room. Maybe that basement can even be turned into an entertainment area for when we get together with friends or family. Just like we all grow and develop new interests, once we are empty nesters our homes can be updated to better serve that part of our life. Transforming our living space into something we need now helps bring joy into our lives and makes our home even more useful and enjoyable that it was 20 years ago! Your life - Your living space! Posted on November 6, 2014 by Victor Burgos. A spacious deck with plenty of room for entertaining is the perfect way to enhance the functionality of your home and take advantage of the great weather we have been having! Take a look at this deck. In particular, notice the railing - it doesn't block the view. Plus it has a durable look and feel while still creating a welcoming environment to enjoy the outdoors. Also note how there is plenty of room for entertaining or just sitting back and enjoying the sun. From this view you can see how the lattice work ties the deck to the landscape and enhances the overall beauty of the home. Usually you just see a giant dark hole or space, which is not inviting at all. 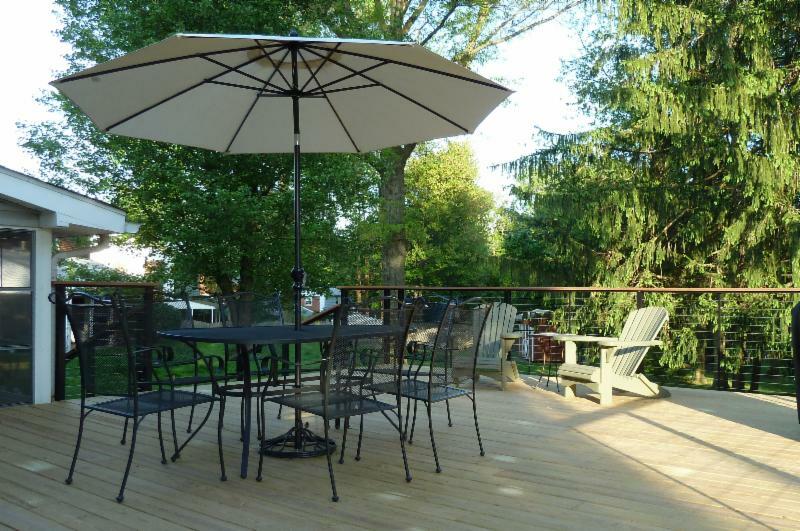 The lattice work makes the deck look clean and inviting and adds that final finishing touch. It is also functional - keeping pets and unwanted animals from taking up residence where they don't belong. We are having a productive Spring and early Summer here at Victor R. Burgos and Son, but we would love to come out and help you with your deck, kitchen or bathroom projects! Also, please check us out on houzz.com. You'll find lots of great pictures and ideas there. Write us a review so we can help serve even more of your friends and neighbors. Posted on July 17, 2014 by Victor Burgos.